Cover this with water and cook till chicken is just cooked, remove and cool. 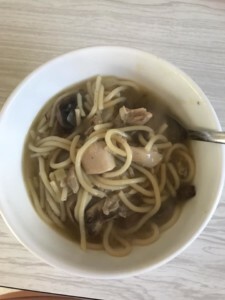 Do not throw this broth away, as you put the spaghetti in and cook till spaghetti is cooked and place one side.. you may need to add more water. In a separate pan melt butter / margarine and fry chopped up cooked chicken, onions and mushrooms till nice and golden brown. Once your mushrooms and onions and chicken is fried add some more pepper to taste, I didn’t add any salt as the stock had enough salt. Then add this to the spaghetti that is still in the stock water.. it will look like a soup.. you can chop some chilli for garnish and some coriander.. I don’t as I just liked it like this but hubby had on his..